A selection of luscious, liquor-flavored cordials pair favorite spirits with fine chocolate. When you decide to indulge, go big or go home. This set of liquor-flavored cordials pairs favorite spirits with fine chocolate for intoxicatingly delicious (but non-alcoholic) treats. 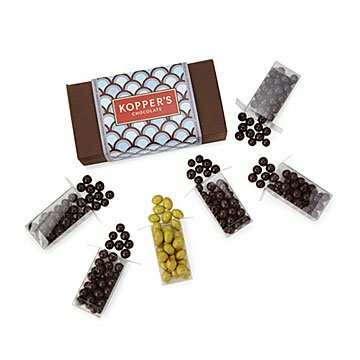 It includes one box of each flavor: champagne, blackberry brandy, amaretto, rum, and whiskey, plus chocolate almonds decorated to look like Martini olives. This decadent array makes a great host or hostess gift. Handcrafted by chocolate makers in New Jersey. Ingredients: dark chocolate, white couveture, cane sugar, cocoa powder, confectioner's glaze, wheat starch, corn starch, gum arabic, palm kernel oil, milk powder, whey powder, palm oil, soy lecithin, vanilla, whole dry roasted almonds, US certified colors, natural and artificial flavors. Contains soy, dairy, and tree nuts. Made in a facility that processes peanuts, tree nuts, wheat, soy, and dairy.